Freyja riding a cat-driven chariot in a painting by Nils Blommér. Freyja (or Freya, Freja, Frejya) is a goddess in Norse and Germanic Mythology. She is the twin sister of Freyr and the daughter of Njord. She was originally worshipped as a fertility goddess but in the Eddas she was often portrayed as a goddess of love, beauty and attraction. She was also associated with war, battle, death, wealth, magic and prophecies. Freyja was said to be the most beloved, honored, and renowned among goddesses. She is one of the most popular deities of Norse mythology. The Valkyries collect the souls of heroes killed in battles and bring them to valhalla, where they will become warriors of the gods. Freyja shares with Odin half of these heroes. Her sacred realm is Folkvang (Warriors' Field), here lies her great and fair hall Sessrumnir (Room of Seats). At this hall, she decides where her warriors shall sit. Freyja married a god called Odr She deeply loves her husband, but he often went away on long journeys, and Freyja cried red golden tears for him. Her tears become gold and amber when they fall to Earth, therefore gold was called "Freyja's tears". They have two beautiful daughters called Hnoss and Gersemi. Freyja often rides in a chariot pulled by big blue cats, or on a golden battle boar. She is called "The Fair One". In the myths, there were three giants who wanted to marry Freyja, but they were all killed by Thor, the god of thunder. Freyja also has a precious necklace called Brisingamen (Jewelry of Fire). The god Loki once stole this necklace, and Freyja had to ask the god Heimdall for help. Heimdall won the fight with Loki and gave the necklace back to Freyja. For this, Loki is also called "Thief of Brisingamen", and Heimdall is also called "Seeker of Brisingamen". When Thrymr, the King of the frost giants, told Loki to ask Freyja to become his wife, the goddess was so angry that heaven was shaken, and the necklace Brisingamen broke. The god Thor later borrowed the necklace and came to the wedding, dressed up as Freyja. Thor killed Thrymr and all his relatives. Freyja is a warrior goddess. Whenever she rides into battles, she gets half of the souls of dead heroes. Freyja is also a priestess, and she taught Odin the magic arts. She has a magical cloak made of feathers which allows her to fly between different worlds. Frigg and Freyja are the two main goddesses in Norse mythology. They were especially worshipped by Vikings. Freyja is said to be the kindest among goddesses. In a poem in Poetic Edda, a young man called Ottar always trusted in the goddesses; he built a rock shrine for the goddesses, and Freyja answered his prayers. She disguised Ottar as her golden boar, and went on a trip to help him find his ancestors. In final battle of Ragnarok, Odin, and Freyr will die. Freyja alone will remain among the gods, and she continues the sacrifices. Freyr's name means "the Lord", Freyja's name means "the Lady". The day of the week, Friday, is named either after her, or after Odin's wife Frigg. The Orion was called Frigg's distaff or Freyja's girdle. Frigg and Freyja may be one and the same goddess. Freyja is also widely known as Vanadis, which means Lady of the Vanir. The metallic element Vanadium was named after her. The Vanir are close relatives of elves. Freyr is the Lord of the elves, his sacred realm is Alfheim, home of the elves. Another well-known name of godddess Freyja is Gefn, which means "Giver", a suitable name for the fertility goddess. Freyja represents the Norse women of Viking Age, whose husbands often went away to war. 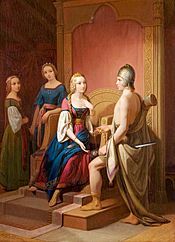 From Freyja's name, noble Norse women are called Fru, wives are called house-fru. And Frau means "woman" in German. Freyja Facts for Kids. Kiddle Encyclopedia.